This CD gives weight to the oft-repeated statement that Bruckner’s String Quintet is a symphony in disguise. In fact, Peter Stangel has only increased the forces modestly, from five players to 11, adding single woodwinds, horn, and double bass. It is effective approach, and while you couldn’t imagine Bruckner himself orchestrating in this way, it demonstrates how much orchestral thinking there is behind the original textures. All of the movements apart from the last begin with just the strings, and the winds are added in at answering phrases. In the opening movement, the main, downward swooping, motif proves particularly amenable to woodwind voicings, especially in the lower reaches of the clarinet. In the second movement Scherzo, the horn contributions are telling, making clear that many of the viola ideas in the original are in fact horn calls. The entry of the winds in the Adagio third movement are so subtle that they require careful listening. They begin with the bassoon supporting the cello line, and the upper woodwinds are gradually added in as the textures expand. Winds and strings are more closely integrated in the finale, where trilled ornaments (are they in the original?) in the flute often dominate the textures. Although the quintet original remains in the mind’s ear, the fact that such a small ensemble is used does underpower the climaxes, which may be why the violin tone sounds thin above the stave. Also, the addition of a double bass might be expected to bolster the lower end, but the recorded sound doesn’t emphasize that, instead retaining a chamber-like lightness in the textures. Finally, the fact that a conductor is involved could lead us to expect a more shaped and sculpted reading, but Stangel’s approach is restrained. The reading has plenty of life, but there are no rubato indulgences, with the climaxes in particular retaining their chamber music scale, on account as much of the steady tempos as the player numbers. As a filler, the Adagio first movement of Mahler’s 10th Symphony is arranged in the opposite direction, the ensemble reduced down to 16 players. Again, the resulting sound is more chamber ensemble than chamber orchestra, with the intimate tone immediately set by the unaccompanied viola opening, now sounding all the more bare and isolated for being played on a single instrument. 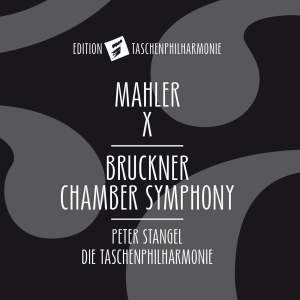 Mahler’s more sophisticated harmonies translate well to the smaller ensemble, and little is lost in the transcription, though the gains are more open to debate—a little more clarity of texture perhaps. The Taschenphilharmonie is a Munich-based chamber orchestra dedicated to keeping alive the spirit of Schoenberg’s Society for Private Musical Performances. That may seem an esoteric pursuit, but it clearly has potential, as their own label, Edition Taschenphilharmonie, has secured a major distribution agreement with Sony and has a catalog that includes all the Beethoven symphonies, as well as symphonies by Mahler, Beethoven, and Mozart. They have also collaborated with the German newspaper Die Zeit on a 13-CD Grosse Klassik für kleine Hörer (Great Classics for Small Listeners) project that sounds like a lot of fun. The change of personnel between the two works recorded here suggests this is a part-time operation, but the musical standards remain high throughout. I’ve only one grumble: The documentation is negligible. The insides of the card gatefold give an orchestra list and a short piece about the ensemble, but nothing at all about the works or arrangements.